A week after the storm, just 318 customers were without power. It likely neutralized any criticism over Gillum's response to Hurricane Hermine two years earlier. Two years ago, John Hettinger and his neighbors in the Twin Lakes Mobile Home Park were some of the last people to get power after Hurricane Hermine tore through Tallahassee. It was hot. His neighbors' calls to the city went unanswered. And he was without power for more than a week. 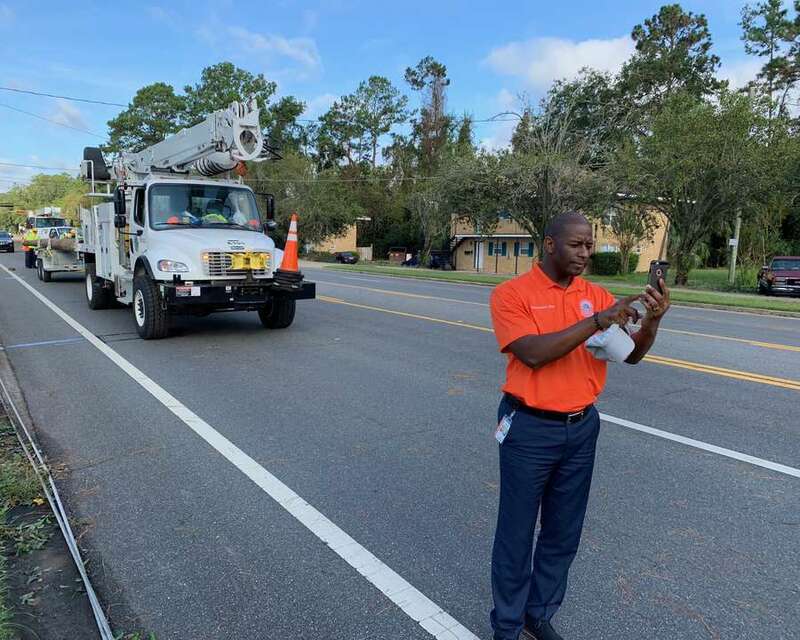 Two years and a major hurricane later, Hettinger was again without power, this time from Hurricane Michael, a Category 4 storm that made landfall about 75 miles away. But this year, power was out for only four days, and the city was far more responsive. "This time was a definite improvement over Hermine," he said Wednesday. A week after one of the worst storms to ever hit the Panhandle, Tallahassee is returning to normal. Schools are open, stoplights are working, and nearly everyone is breathing a sigh of relief — perhaps none more than the city's mayor, Andrew Gillum, who had a potential governorship to lose if the city struggled in the storm's aftermath. "I've been very impressed by the city and county's response," said County Commissioner John Dailey, who's running to replace Gillum as mayor and was one of the most vocal critics of the city's response to Hermine. "People have been very patient, very gracious, wonderful to work with through this." Hurricane Michael knocked out power to nearly everyone on the city-run electric utility, and while the storm wasn't nearly bad as everyone feared, the recovery was better than most expected. During Wednesday's city commission meeting, the response was glowing, with residents and business owners standing before Gillum and commissioners with stories of neighborly cookouts and quick recoveries. "They say old dogs can't learn new tricks, and not to say that you're old, but ya'll learned a ton," Kathleen Brennan told Gillum and the commissioners, with the audience breaking out in applause. "You listened, you learned and you implemented. I just think you did a fantastic job." Going into the storm, television ads paid for by the Republican Party of Florida were hammering Gillum over the city's response to 2016's Hurricane Hermine, a Category 1 storm. The ads were claiming that Gillum turned away help after the storm, which PolitiFact rated "mostly false." But many in the city were angry with the city's slow response to that storm, which knocked out power to 80 percent of the city. Power was mostly restored within four days, but many felt the storm was too weak to justify needing longer than that. Hurricane Michael knocked out power to 92 percent of the city and damaged more than 1,000 buildings. Gillum and others credit learning from the mistakes of Hermine. The city asked for hundreds more utility line workers before the storm made landfall, something it didn't do before. Political observers say that the response will likely neutralize the Hermine ads. But whether it will do more to help Gillum's political hopes is unknown. Polls showed him holding a narrow lead over DeSantis going into the storm. Gillum, as mayor, does not manage the city or its workers — that's the job of City Manager Reese Goad, who's mostly responsible for the city's recovery. Gillum instead was the face of the city, making dozens of national television and radio appearances before and after the storm. Images of him filling sandbags and wielding a chainsaw on downed trees went viral. That exposure could give him a small bump, political observers say, but everyone's minds have probably already been made up next month's election. "Party ID and your view of Trump are probably the biggest things for this election," said University of Central Florida political science professor Aubrey Jewett. Darryl Paulson, a retired professor of political science at University of South Florida St. Petersburg, said Gillum's exposure pales to Gov. Rick Scott's, who has been seen at disaster sites all over the Panhandle and meeting with President Donald Trump. "It's a different impression than someone who's out there with a chainsaw," he said. "They (voters) may not perceive that as political leadership." Not everyone was thrilled with Tallahassee's recovery, however. Barney Bishop, who created a task force led by former Lt. Gov. Jeff Kottkamp to look at the city's mistakes after Hermine, said he formed another one at 2:58 p.m. Wednesday, again led by Kottkamp, a Republican. He said that while the city did better during Michael, he noted that the pace of recovery was still mostly the same. "That's not progress," he said. "That's going backwards."